The entire reason I even made the Paleo Salted Caramel Sauce and Paleo Pumpkin Butter I posted earlier this week was for this crepe cake. Have you ever made a crepe cake? (Have you ever made crepes? Please say yes.) I’ve always wanted to make a crepe cake, and I feel it’s a travesty that I never have, considering I’ve probably made thousands of crepes in the last 15 years. You might be wondering why these crepes aren’t paleo. Well, I haven’t found one yet that I like that resembles a crepe rather than an omelet. I’ll work on it and get back to you. In the meantime I make gluten-free ones. Right now I’m using King Arthur’s Gluten Free Flour Blend Recipe and it works great so far and the ingredients are easy to find. 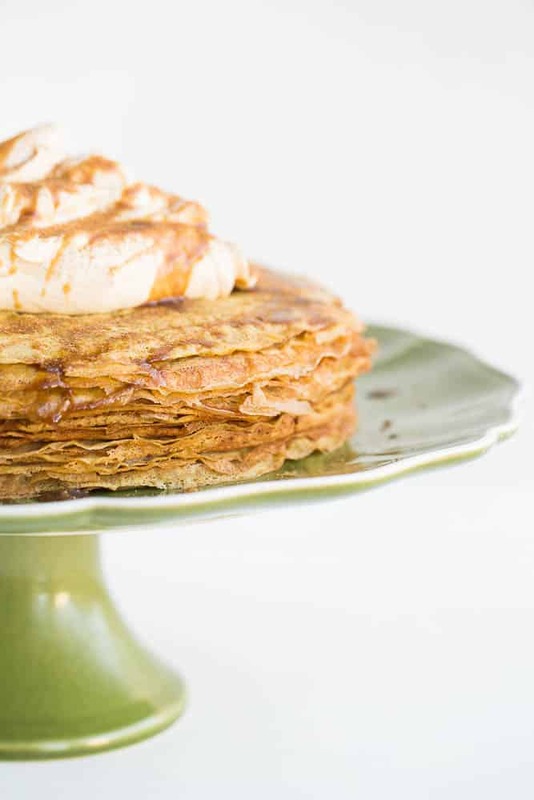 OK, so, let’s talk about crepe cakes. 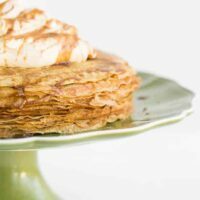 A crepe cake is just a stack of crepes with filling in between the layers. That’s it. It only takes about 20 crepes, too, so if you just want to go out and by pre-made crepes, you can totally do that. It might be impossible to find ones that need to fit a specific nutritional need, like gluten-free or dairy-free, though. Luckily making them isn’t hard once you get a few under your belt. One of these days I’ll post a step-by-step tutorial on crepe-making with lots of tips. Until then — the best piece of advice I can give you is to not be discouraged if the first couple don’t turn out well. According to some crepe-making law of the universe, the first couple always turn out weird. Always. Also, if the crepe begins to rip or fall apart when you try to flip it, then it’s not ready to be flipped. 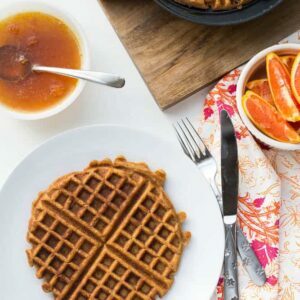 For this you’ll also need to make a batch of Paleo Salted Caramel Sauce and Paleo Pumpkin Butter. I made both of those almost a week before I assembled the cake. They keep so patiently in the fridge. Grab a pretty plate or a cake stand and start layering, alternating the pumpkin butter and the caramel between the layers. It’ll need to chill for a couple hours after this. Whip up some pumpkin spiced coconut cream and dump it all on top. I’ve always been lukewarm when it comes to whipped coconut cream. I tolerate it when I need to, but I’m so in love with actual whipped cream that I usually just use the real thing. This version may have changed my mind. I kept licking my fingers and couldn’t believe how good it was. You’ll love it. Slice it up! See how rad it looks when you slice it? It slices really easily and cleanly, too. 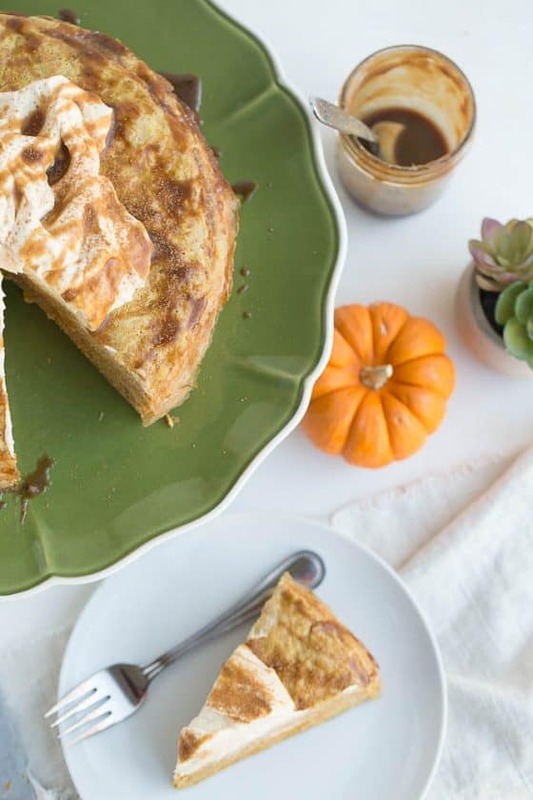 This tastes a lot like pumpkin pie, which surprised me.You NEED to make this — especially if you’re in charge of dessert and you need to make a gluten-free, dairy-free dessert! 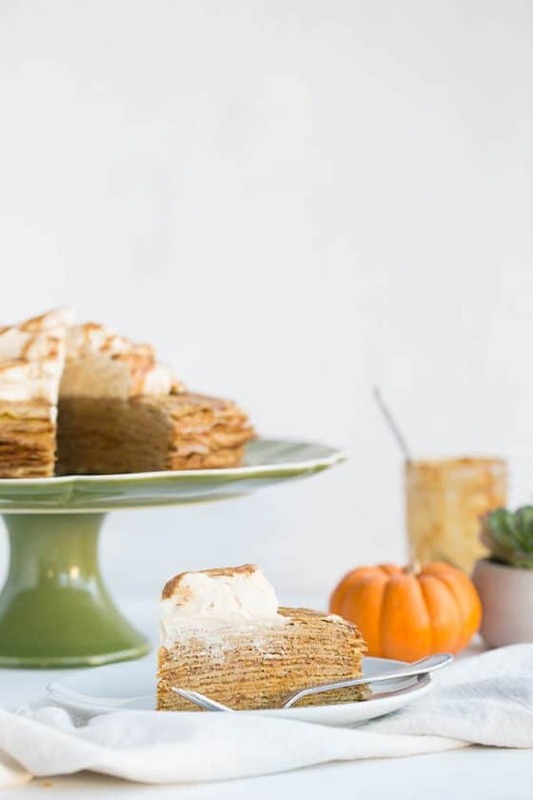 Here are a couple more gluten-free dessert options for you — Gluten-Free Pumpkin Roll and Gluten-Free Angel Food Cake over on Meaningful Eats! 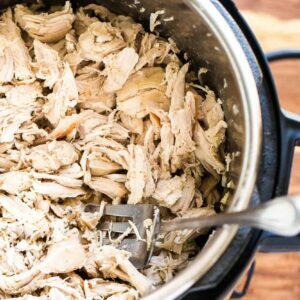 If you're avoiding gluten and dairy, the holidays don't have to be a bummer. This crepe cake is a show stopper, whether you're GF or not! Put half the amount of each crepe ingredient into a blender in the order listed -- except the coconut oil). Blend for 1-2 minutes until fully combined. Let the batter sit for 5-10 minutes to allow the bubbles to subside. Heat a 10-inch nonstick skillet over medium heat. (Seriously, use a nonstick or you'll be really upset.) Brush the skillet lightly with coconut oil. Pour about 1/3 cup of batter into one side of the skillet and immediately tilt and swirl the pan until the bottom is coated evenly in the batter. Cook the crepe for a few minutes until the sides are golden brown and the top appears to be dry. Using a heat-safe rubber spatula, scrape around the sides of the crepe to loosen it from the pan and under the center. If it loosens easily it's ready to flip. Flip it over and let it cook for another minute or two. Transfer the crepe to a plate. Repeat with remaining crepe batter, brushing the pan lightly with coconut oil, and adjusting the heat as needed. The batter should sizzle, but not splatter, when it hits the skillet. When you're done with that batch of crepes, count to see how many nice, round ones you have. If you have 20, you're done! 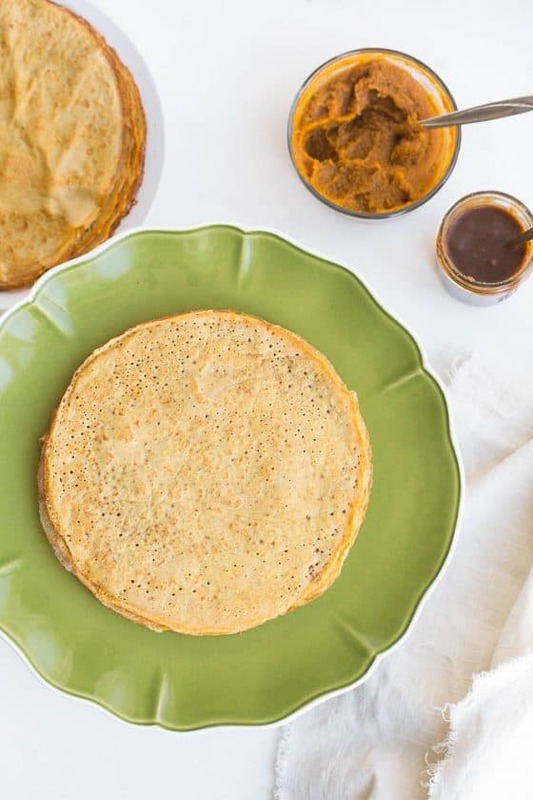 If you need more, then make another batch of batter and cook up more crepes and imagine how amazing breakfast is going to be tomorrow morning with the extra crepes. Allow the crepes to cool. 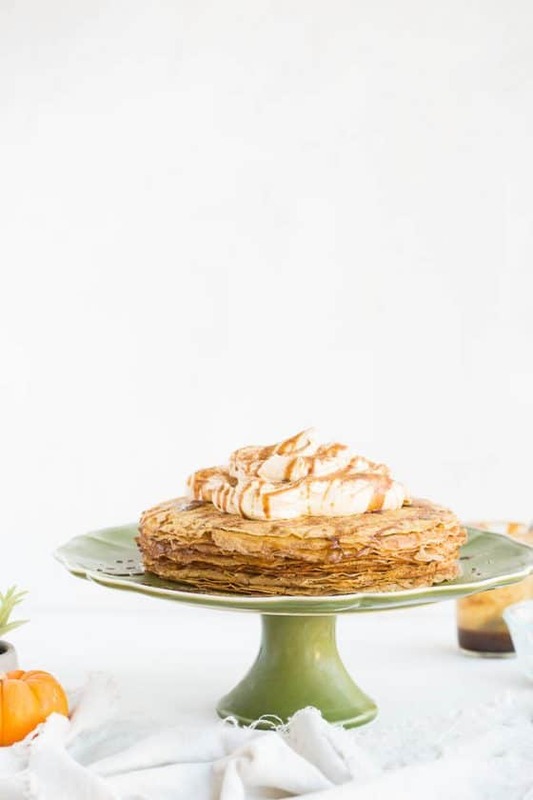 Lay one crepe on a pretty plate or a cake stand. 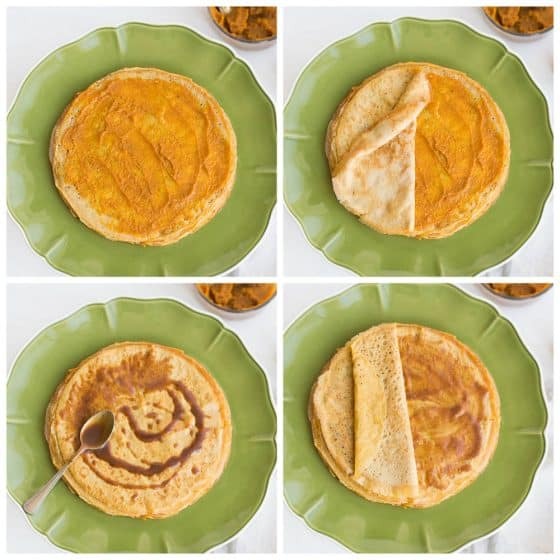 Spread about a Tablespoon of pumpkin butter evenly on the crepe, leaving a 1/4-inch border. Lay a crepe over the pumpkin butter and spread a couple of teaspoons of caramel sauce on that crepe. Repeat the layering until you've used 20 crepes. Cover the crepe cake with plastic wrap and chill for about 2 hours, up to 12 hours. Make the coconut cream by whipping the chilled coconut cream in a medium bowl with an electric mixture until fluffy. Add the remaining ingredients and beat well, for about 30 seconds until everything is incorporated and the mixture is fluffy again. Chill until ready to use. When you're ready to serve the cake, remove it from the fridge and pile the coconut cream on top. Sprinkle it with a bit of pumpkin pie spice, if desired. Slice and serve with remaining caramel sauce. Cover and chill the leftovers.